The Rockschool Keyboard syllabus is an essential resource for contemporary pianists and keyboard players. Created with the modern musician in mind, it equips all aspiring keyboard players with the knowledge needed to confidently perform within the dynamic world of popular music. The tracks featured at each Grade are split into three keyboard-specific and three piano-specific hit tunes. We want you to plot your stylistic specialism, helping you to develop an in-depth understanding of the type of music that appeals to you most, whether that’s a particular genre, keyboard-specific sound manipulation or developing traditional pianistic techniques. The Rockschool Keys Grades feature a collection of meticulously researched and suitably arranged hit tunes from the world’s greatest artists, films and musicals. The tracks have been devised for students to learn through the music they love with repertoire arranged and benchmarked with the key technical skills required at each Grade. These keyboard-specific arrangements utilise varied levels of sound manipulation, patch switching, layers and splits. The Rockschool keyboard repertoire provides students with an expansive song choice, from a diverse range of genres, including tracks from Ariana Grande, Chvrches, Michael Jackson, Kate Bush, Stevie Wonder, Tori Amos, Eurythmics, Snarky Puppy, Pirates of the Caribbean, Schindler’s List and and many, many more. With 9 levels of keyboard grades, all abilities are covered. Download all of your backing tracks for your keyboard practice: examples & performances. This is a brand new Keys syllabus and is not the same as the old Band Based Keys from several years ago. Check out the new Piano syllabus also released in 2019. Completing a Rockschool Music Grade is a rewarding experience; we’ll get you on your path to success in no time. The NEW 2019 Keys books will be available from March 2019. To start Rockschool Keys, you’ll need a Rockschool book. Start with the Debut book and work your way up through the Grades or jump in at a level that’s right for you! 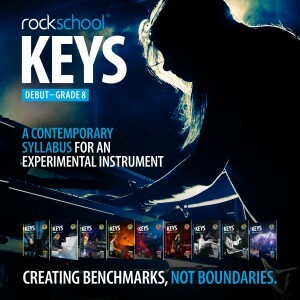 The course content for Rockschool Keys is listed in the syllabus guide, starting at Debut and going all the way up to Grade 8. Please note: This NEW Keys Syllabus will be available for examination from September 2019 onwards. For information on sitting a Piano/Keyboard Diploma Exam please go to the Performance Diploma page. I always give my pupils the choice of exam board when they approach me about exams, and every time they've picked Rockschool. "RSL's Piano syllabus offers a thorough and wide ranging curriculum for the aspiring contemporary pianist ... you'll be covering every aspect necessary for developing a solid set of skills that are technically and stylistically relevant in today's fast moving and demanding music industry... Great Work. I'm very happy to have found Rockschool, my pupils are so enthusiastic about the pieces and enjoyed their exams. Never before have I had a pupil text me after an exam, 'The exam was GREAT!'. I'll be using more rockschool books in future as they are very popular with my students.